Food lovers will be assured of some great dining at the Metropark. All the food has to meet the high standards of renowned masterchef Yim Siu Wai. A member of the ‘Les Amis d’Escoffier Society’, he has hosted many successful food festivals. With that pedigree, his House of Tang restaurant on the second floor carries a quality mark from the Hong Kong Tourist board. 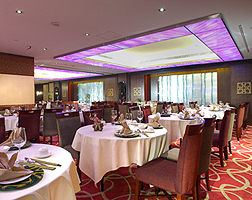 The restaurant is known for fine Chinese cuisine, including delectable dim sum. Also supervised by Yim Siu Wai, there are international buffet and a la carte options featuring Continental and Asian specialities in the Palm Court Western Restaurant. The Metropark’s Sip Sip sports bar is where to go for a not-so-quiet drink and the latest in Premier League football live on TV.